Not only does Vučić (pictured above) have the luxury of an absolute majority in the National Assembly, it will be the first time since 2000 that the Serbian right simultaneously controls both the government and the presidency. Vučić comes to power with an ambitious agenda and if he succeeds, he could restore the high-growth economy of the early 2000s and nudge Serbia on a firm path into the European Union. Critics worry, however, that with so much power, Vučić could veer toward an authoritarian course similar to that of Hungarian prime minister Viktor Orbán, which could potentially alienate Serbia from its European allies and derail the decade-long project of closer European integration. Two years ago, when Tomislav Nikolić won the presidency, it wasn’t clear whether the Progressives, with Nikolić’s history of skepticism toward European integration and friendly relations with Russia, would continue the previous government’s commitment to EU accession. For now, Vučić’s supporters far outnumber his opponents, and they believe that he has the drive, the political skill and now the electoral mandate to drag Serbia’s economy out of the doldrums and bring Serbia even closer to joining the European Union over the course of the next decade, perhaps as soon as the year 2020. Increasingly over the term of the 21-month coalition between the Progressives and the center-left, nationalist Socialist Party of Serbia (Социјалистичка партија Србије / SPS), Vučić became more powerful than outgoing Socialist prime minister Ivica Dačić, and it was only a matter of time before the Progressives demanded snap elections. Vučić promises to accelerate the current government’s austerity measures — his finance minister Lazar Krstic joined the government last summer in a push to bring Serbia’s budget deficit under control. Krstic, at age 29, is a Yale-educated economist and a former McKinsey consultant without affiliations to any Serbian political parties, and he’s expected to remain as prime minister in the new Vučić government (which may or may not include Dačić’s Socialists, or may or may not include one of the two parties of the decimated Serbian left). Last year, Krstic oversaw the rollout of a set of painful measures, including wage cuts for public-sector workers by up to 25%, subsidy cuts for bloated public-sector companies, tax increases and other efforts to crack down on smuggling and other black-market activities. Vučić hopes to introduce a raft of liberalization reforms later this year — a new bankruptcy law, looser labor laws and the privatization of state-owned industries. Talk is easy, especially with the political wind at your back, but Vučić seems serious about reform. Last summer, Vučić hired former International Monetary Fund director-general Dominique Strauss-Kahn as an adviser to the Serbian government. But Vučić’s most popular position is his stand against corruption. Serbia has made gains over the past decade, and Transparency International ranked Serbia #72 globally on its corruption perceptions index in 2013 — that’s only slightly behind Italy (69), and it’s marginally better than current EU members Bulgaria (77) and Greece (80). Still, there’s plenty of room for improvement, and running an election campaign against greedy, corrupt oligarchs in a depressed economy was probably politically wise. Generally speaking, Serbia’s economy is improving, but not enough for many Serbians to feel it. Steady growth throughout the 2000s plummeted after 2008 — GDP contracted by 3.5% in 2009, grew by just an average of around 1.35 in each of 2010 and 2011 before contracting 1.7% again in 2012. Serbia’s economy returned to growth under the SPS/SNS coalition government in 2013, but forceasts for 2014 expect around 1% GDP growth. The unemployment rate has dropped from around 26% to around 20%, but it’s obviously still elevated at crisis levels. Serbia’s public debt has exploded over the past five years — it’s currently around 60% of GDP, so it’s understandable why Vučić is so intent on cutting the deficit. The Dačić-led government brought the deficit down from over 6% of GDP in 2012 to around 4% last year, but the government is targeting a 7.1% deficit this year. That means Vučić and Krstic will have to keep trimming in order to bring the budget within the European Union’s standard of just 3% of GDP. If the government cuts too much too rapidly, however, it could choke the Serbian economy’s narrow recovery. Though Vučić is working with EU and IMF economists to reform Serbia’s economy, he’s not shy about cultivating other relationships that could give Serbia access to even greater amounts of alternative financing. Serbia’s longstanding cultural and political ties to Russia also make it a strategic European ally at a time when EU leaders are contemplating sanctions against Russia for its military aggression in Ukraine and Crimea. Russia has recently provided loans to Serbia, vociferously opposed Kosovo’s independence, and the two countries are working together to build a ‘South Stream’ natural gas pipeline through Serbia that would supply up to 15% of Europe’s gas. Most recently, Vučić has cultivated ties with the Sheikh Mohammed bin Zayed, the crown prince of the United Arab Emirates, and he campaigned on a plan that would commit up to $4 billion of UAE investment in a Belgrade development project, and it follows a $1 billion loan form the UAE to Serbia earlier this month. It’s a far cry from the 1990s, when Vučić famously said that he would kill 100 Muslims for every Serbian killed during the tumult of the Bosnian civil war. Vučić served as minister of information between 1998 and 2000 in the final government of Milošević’s presidency, and during the 1999 NATO military action in Kosovo against Serbia. Throughout the 1990s, Vučić and Nikolić both served as top leaders within the anti-Western, far-right, ultranationalist Serbian Radical Party. When Nikolić won the Radical Party leadership in 2003, Vučić served as his deputy leader, working to move the party into the more moderate mainstream — an effort that ultimately failed. The Radical Party split in 2008, with Nikolić and Vučić forming the much more moderate, business-friendly and pro-Western SNS as they began to take a much stronger position in favor of EU integration. He’s also not the only figure in Serbia today with a questionable past. Dačić, the outgoing prime minister, was once considered a Milošević protégé and served as the spokesman for Milošević’s Socialist Party between 1992 and 2000. Over the course of the last decade, Dačić (like Nikolić and Vučić) worked to distance his party from the dangerous nationalism of the 1990s. 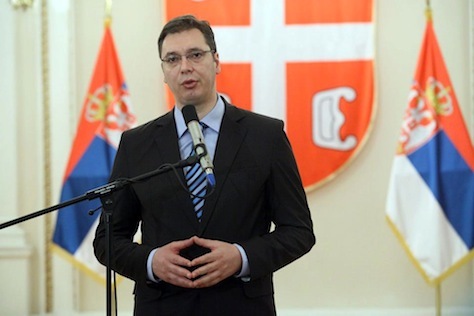 Notwithstanding their former regrets, both Dačić and Vučić pushed over the past 21 months to propel Serbia-EU relations, to cooperate with the International Criminal Tribunal for the former Yugoslavia by handing over wanted Bosnian Serbs and to engage Kosovar leaders in negotiations for what might ultimately become official Serbian recognition of a sovereign, independent Kosovo. Previous PostSerbian Progressives win huge victory, majority in National CouncilNext PostForget 1938. Here’s another historical analogy: 1914.